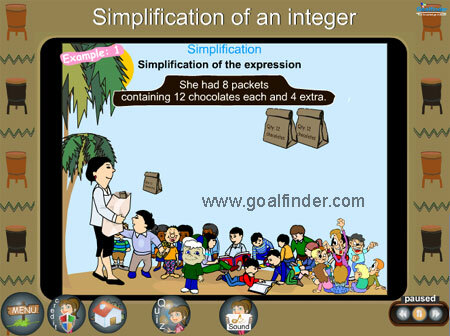 Fully animated 'Integers - Simplification’ covers the concept using real life examples. This will help you to simplify complex expressions having vinculum, of and brackets. All the techniques are explained in a very detailed manner. The simplification of integers involves the application of BODMAS rule to the complex arithmetical expressions involving integers. Solving Simplification of Integers with real life problems is the basis of the animation. 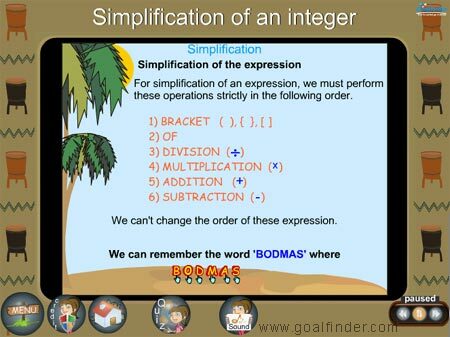 The simplification of integers section involves the use of BODMAS, a rule that enables us to know exactly the right sequence to perform an arithmetic operations. Example 1: What do you think the answer to 2 + 4 x 3 is? There is a quiz on word problems in integers with detailed solutions that will give a thorough understanding of the concept. The animation covers the arithmetic operations of solving integers using real life examples; a quiz section with detailed solution also checks your understanding.